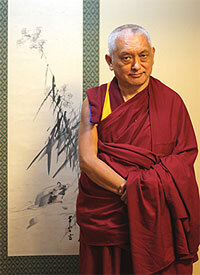 Rinpoche in front of ink painting, Japan, September 2008. To find more information as it becomes available, and for details of how to contact the center and book for these events, please go to Rinpoche’s Schedule. We have recently updated this webpage to be even easier for you to use! Rinpoche reciting prayers with, Nyla, his new small friend, Japan, September 2008. “What FPMT is trying to do is our very best to benefit sentient beings and to preserve the Dharma. We do this through helping the great monasteries to spread the Dharma widely, and through providing Dharma teachings at centers in order for students to purify and collect extensive merits, and meditate on the path to enlightenment. Rinpoche recently commented that it would be good for centers to place dragons (forceful or strong ones) at the door of FPMT centers. This gives strength to the center. They can be placed on either side of the door or above the door. Often there is a jewel that is between the two dragons. The main point is that it is important how the dragons appear – the dragons need to be in good shape, forceful and strong. Rinpoche said these dragons can be different sizes depending on the size of door and so on. The Foundation Store has a small stock of dragons, and it may be possible to buy good forceful dragons in Nepal. Enjoy a wide selection of photos of Rinpoche in our photo gallery! Rinpoche is currently in Dehradun in the Himalayas, taking initiations from His Holiness Sakya Trizin. The name of these sets of initiations is Wangya Norbu Tangwa (Garlands of Jewels of Hundreds of Initiations). The initiations will be given over a period of about 5 weeks this year, and then will continue again next year and the year after and so on – there are many initiations! Lama Zopa Rinpoche with His Holiness Sakya Trizin in Dehradun, India, September 2008.
and arranged for these transmissions to happen in order to bring these initiations back into the Gelug tradition, thus helping to preserve the Mahayana tradition in general. There are more than 700 lamas (including about 100 high Gelug lamas), monks and nuns attending – and Rinpoche and a number of very kind benefactors are the main sponsors. We are offering dinner for all those attending, as well as offering accommodation, food and transport for the main Gelug lamas. His Holiness Sakya Trizin said he was very happy with FPMT and is always impressed when he goes to one of our centers. His Holiness said that FPMT “is preserving the pure Dharma”. He said he was very grateful. He also said that he gets Mandala and enjoys reading it and hearing about all the many activities around the world – “very inspiring,” His Holiness said. Something wonderful for us all to rejoice about! We’re delighted to announce that Cheryl Gipson, a student of Lama Zopa Rinpoche, recently joined the International Office team. Cheryl has an extensive background in nonprofit internet technology and development. Since 2003, she directed the Nonprofit Services Division at Network for Good, a nonprofit technology service provider. At Network for Good, Cheryl assisted hundreds of organizations on their internet fundraising strategies through the creation of an online internet fundraising learning series, and led the product development of an internet donor database, the “Donor Management Suite”. Cheryl had already been helping us as a volunteer to implement our new database and will be leading a variety of technology and development initiatives at FPMT. Cheryl was one of the original students of Tse Chen Ling in San Francisco, and offered service there as interim director, so she brings very helpful familiarity with FPMT to her new role helping International Office to fulfill its mission and serve Rinpoche and the FPMT organization. NEW PROGRAM FOR ALL: In 2009 Rinpoche will be teaching Atisha’s Light of the Path at Kadampa Center, USA Oct 1-15. Rinpoche has said he will continue the teaching annually until the text is completed. This is a fantastic opportunity to participate in an experiential lam-rim teaching led by Rinpoche. Education Services plans to create a comprehensive program from this teaching event. With the help of retreat assistant, Thubten Gyatso, on-site as well as other elder FPMT teachers providing follow-up online, we hope to develop an ongoing program that will capture the very essence of Rinpoche and Lama Yeshe’s lam-rim teachings. Stay tuned for monthly updates in FPMT News and via the new program’s informative webpage. NEW HOMESTUDY PROGRAMS: Heart Advice for Death and Dying will be available in late November/early December. The program consists of a book of heart advice on death by Lama Zopa Rinpoche and an MP3 audio CD of Ven. Sangye Khadro giving teachings and leading meditations on the topic. An additional book of Heart Practices for Death and Dying by Rinpoche is supplementary. Also coming soon is Buddhism in a Nutshell, containing a book by Rinpoche and an MP3 audio CD of teachings and guided meditations with Ven. Amy Miller. BASIC PROGRAM: Ven. Marga, director of Nagarjuna C.E.T. Barcelona, has kindly accepted to be our Spanish BP coordinator, helping to get our Spanish BP materials more organized and keeping us up to date with Spanish BP developments. Ven. Marga knows the BP well; as the first director in Spain to take up implementing the program, she has coordinated offering it as a homestudy program as well. In France, Institute Vajra Yogini continues the tradition of offering a one month lam-rim retreat each January. This allows French PEBA students (PEBA is the French name for the Basic Program) to collect their 3 month lam-rim retreat requirement in the course of their five years of BP studies. Students both from Paris and from IVY make use of this opportunity. Kalachakra Centre offers a short retreat in November to prepare students and offer them a taste of a lam-rim retreat. The second BP final exam will be offered in 2009. If your center has BP students who qualify to sit for the exam and would like to participate, please let us know. Essential Buddhist Prayers, an FPMT Prayer Book, Vol. 1 has been entirely re-formatted according to the input and suggestions of users. Ven. Mindrol has done a miraculous job of completely revamping the formatting for ease-of-use while at the same time managing to keep the page numbering the same so that both the new and previous edition can be used in group situations without confusion. We hope to secure a benefactor so that all new study groups can receive complimentary copies. Both the North America Regional and Australian National meetings will include an Inner Job Description training component. The training in Portland, USA will be video recorded and in 2009, we hope to launch FPMT Service Trainings online so that many more can attend. We would like to keep a listing of initiations being given by Lama Zopa Rinpoche, Rinpoche’s teachers and FPMT Touring Lamas so that students who need to take certain initiations can easily find out where they are being given. So, if you are organizing an initiation from one of these lamas, please let Center Services know, and we will add that information to our upcoming initiations list. Thanks again to all who responded to our survey about FPMT International Sangha Day. Based on the responses received from various centers in Europe, for whom August is holiday season, IMI and FPMT International Office have agreed that for 2009 participating centers should choose whether to celebrate International Sangha Day on First Turning of the Wheel of Dharma day or another auspicious day that better fits the European calendar. We’ll review how this works later next year. 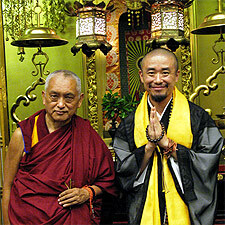 Rinpoche with Japanese Master of the temple in Tokyo where Rinpoche’s recent teachings were held, September 2008. The FPMT Handbook is being updated – and contains some new policies for the FPMT organization. Please watch out for the announcements of these new policies, and also for the publication of the updated FPMT Handbook, via the CPMT e-group and the FPMT Affiliates Area. mandala as center/project director, resident and touring teachers, spiritual program coordinator, board member, study group and regional and national coordinators are invited and strongly encouraged to attend – more information available in the FPMT Affiliates Area! We have re-organized the list of FPMT-registered teachers by categorizing teachers according to FPMT Standard Education Programs – have a look at our touring FPMT teachers and see what you think. A new useful checklist for retreat planning is available for you from Rinpoche’s Advice page (under “Retreat”) and the FPMT Affiliates Area (under “Practice Materials”). We have put Rinpoche’s advice about marriage ceremonies and who is best to conduct them (i.e., lay elder students) in the FPMT Affiliates Area. Rinpoche being interviewed on Mongolian TV, Ulaanbaatar, Mongolia, September 2008. Animal liberation is one of Lama Zopa Rinpoche’s heart practices. Animals that are slated to be killed are rescued and circumambulated around holy objects and sacred texts in order to plant the seeds of enlightenment in their minds. They receive blessings from blessed water in addition to enjoying the prayers that are said for their good rebirths and the benefit of all beings. Later, they are released into safe environments to live out their natural lives. At Lama Zopa Rinpoche’s home, extensive animal liberations are done three times a month. Please rejoice knowing that over the past three years, over 115,000 worms, crickets and lady bugs have been liberated by Sangha and students in the area! Dedications are made for the long life of His Holiness the Dalai Lama, Rinpoche and all of Rinpoche’s gurus, as well as for all beings that are sick or face untimely death. The International Sangha Prayers for World Peace, the International Mahayana Institute community’s offering to celebrate FPMT International Sangha Day had over 500 people participate in the prayers. A total of 1, 674 recitations of the Sutra of Golden Light were offered (and confirmed) for world peace. Rejoice in this wonderful offering to our teachers, to our leaders and to our fellow sentient beings! Keep checking for interesting opportunities to offer service in FPMT centers around the world. Opportunities include Spiritual Program Coordinator at Chenrezig Institute, Australia; Facilities Manager at Milarepa Center, Vermont, USA; and General Manager at Centro Kushi Ling, Italy. The purpose of meditation is not to reach nirvana and then disappear. If that was the case, it would better that you manifested as a flower!